The Old Brick Tavern is sometimes referred to as the Lincoln Hotel because of its location on the Lincoln Highway. There is also the legend that Abraham Lincoln stayed at the tavern two nights waiting out a snow storm as he was traveling on a law case. The tavern also has an important connection to the Underground Railroad, that network of places hiding runaway slaves during the Civil War. The owners of the property, the Haven Family, were abolitionists and leaders in the network of rescue locations. 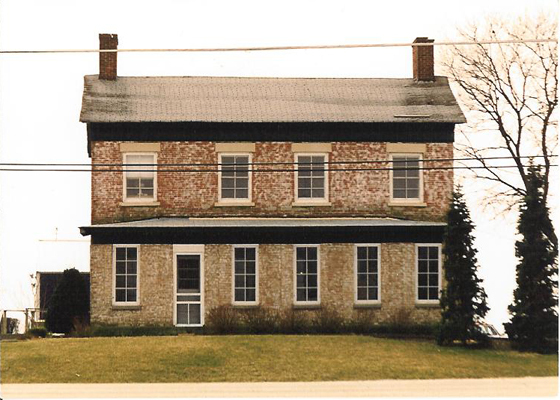 In the 1840s the tavern was constructed of bricks made on-site, using clay dug from a pit in the back yard. Brick buildings were a rarity at the time; frame buildings were common because the materials were easier to obtain and faster to build. The tavern was a stagecoach stop and provided meals and sleeping accommodations for the passengers. Later it became a private home. Sadly the tavern was destroyed after more than 150 years of existence to “make way for new construction.” The monument which marks its location is made from the bricks rescued from the rubble. Named a Will County Landmark in 1995. Monument located on the Lincoln Highway at the intersection of Joliet Highway. 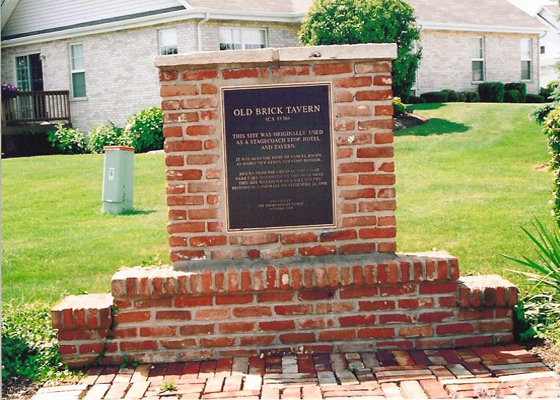 The Old Brick Tavern just before its destruction and the monument which stands today.